Oh Tab, I love you so much! Will you marry me? Wait, are you a guy or or a girl? Oh I don’t care, all I know is that I want you in my life forever! As much as I love Tab, I always felt Diet Pepsi may be a good runner up and thought I should do an evaluation sometime with DP and that sometime was tonight. I decided to conduct this taste test with my eyes closed to see if my devotion to Tab was just habit and all in my head or the real deal. With my eyes closed and turned away from the drinks, I asked Ethan to hand me one of the glasses and pick up the other one so I wouldn’t know which one he gave me. I had to get the stupid grin from anticipation off my face and finally took a sip. As soon as I did I said “Oh my God this is Pepsi” and grinned again. I didn’t look, but I’m guessing Ethan rolled his eyes in enthusiasm for my passing the Tab loyalty test. There is something slightly soapy to me about most diet drinks, I’m guessing it’s the aspartame and this came though in Diet Pepsi, although I do like it for what it is, it’s no Tab. Ethan thought it was tasteless and the bubbles were too small. All I could say was that it’s just so very, VERY good and ditto everything from my last Tab post. Even Ethan who says he doesn’t like Tab, agrees it has more flavor. The bubbles are like applause in my mouth with a sweet, yet full bodied flavor that is uniquely Tab. Somehow it masks the aspartame better than other diet drinks. Tab does it again, and I know it will always have a place in my heart, and my fridge, forever. Ethan is not a Diet Cola person so he won’t be drinking either of these again, until Tab has a new competitor to beat into the ground 🙂 Although if I ever find myself in the south or wherever they sell Diet Rite that isn’t 2 years old, I’d be interested in trying that again since people really seem to like that. I’m not a fan of Diet Pepsi, but I always hated Tab. I’ve had Diet Rite, but it always seems fairly flat (both flavor-wise and carbonation-wise) to me. Diet Coke is my poison of choice. To be fair, I haven’t had Tab since it was being made with saccharin so I’m sure it has changed, and almost certainly for the better. However, the chances that Tab will ever cross my path in Japan are pretty much zero. I agree with you about diet soda’s being soapy with the aspartame. We used to have diet pepsi but pepsi max took over and now we have normal pepsi or pepsi max, that’s it. In comparison there is coke, diet coke, coke zero, coke with lemon, coke with lime etc etc. You can see who owns the market in australia. Tab takes me back to my formative years. I just saw a Tab energy drink. Unfortunately, it tastes nothing like it’s namesake. Tab stands for “Totally Articifial Beverage”. Have you noticed that Stop and Shop in Framingham always seems to be out of TaB? I love TaB, as well, and feel so fortunate that my neighborhood grocery store always keeps it in stock. The distinctive, bold, full-bodied flavor of TaB is so satisfying. The carbonation is perfect. 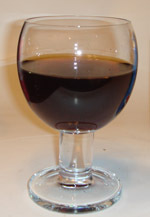 Like a good non-diet soda, there’s a bit of syrupiness to TaB that makes it seem so much richer than other diet colas. I hope Coca-Cola never quits making TaB. 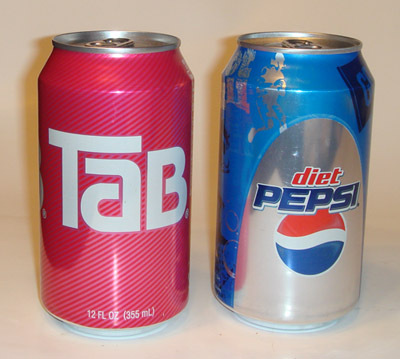 Diet Coke and Diet Pepsi seem watered-down compared to TaB. Coke Zero and Pepsi One don’t taste watered-down but have strange off-flavors and annoying aftertastes. Diet Coke with Splenda is nearly as good as TaB when freshly made but gets nasty as it ages on the store shelves. TaB, on the other hand, doesn’t have any of these faults. It’s terrific, can after can, 12-pack after 12-pack. Diet sodas are one of the least healthiest things you could consume. I choose neither. Agreed on the least healthiest things you could consume,Alex.